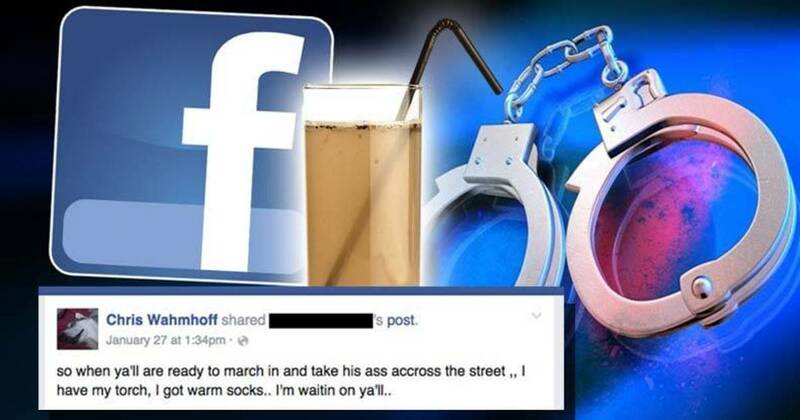 Flint, MI – Activist Christopher G. Wahmhoff, 37, is facing charges after he made a Facebook post referencing the water crisis in Flint, Michigan. Wahmhoff was already on probation for an act of civil disobedience two years ago. He crawled into an Enbridge pipeline and stayed in there for ten hours to protest the expansion of a recently ruptured oil pipeline that had already damaged the local environment. Ever since that protest, Wahmhoff has been on probation and faces regular scrutiny from his probation officer. Wahmhoff says he believes the orders to put legal pressure on him came from the highest levels of the state government, and not directly from his probation officer. “I don’t think this comes from the county. It comes from the same state that poisoned Flint, destroyed Detroit and didn’t do things well here with the Kalamazoo River spill,” he said. Wahmhoff insists that his post was not a call for violence, but a call for protest. “I thought it was a common cultural reference. But, maybe not,” he said, adding that, “My “torch” was a reference to the clichéd angry mob of citizens carrying torches and pitchforks,” which he said was a metaphorical statement that was meant to represent a protest. Many attorneys have commented that his posts are protected free speech. However, the terms of his probation could actually take away his right to free speech. Unfortunately, since he is on probation for protesting the destruction of his local environment, Wahmhoff is restricted from expressing himself in ways that the government does not like.